I have a question. In the topic: "does anyone here..." some posted a pic of Alexander III and Marie's 2nd son Alexander Alexandrovich. This pic is obviously a funeral pic. Does anyone have pics of him when he was alive? There were so many pics taken of Nicholas as a baby. I think it's weird that they never took any pics of their 2nd son before he died. I argee. That's really weird. From the only pic I've seen of him, he seems really cute. I posted the photo of him thinking it was the infant Nicholas, perhaps at his baptism. The book was in Russian but it ID'd it as Nicholas. Obviously, it doesn't seem to be he, but rather Alexander. Poor thing, he was a sweet-looking baby. I always wondered about photos of him, but there are perhaps a lot of photos either lost or still in archives. If Marie F. managed to take any with her to Denmark, perhaps in the archives there? They can be pretty stingy. As much as all the Danes loved to take photos, I can't imagine she didn't take any of this child. You always see a member of that family with a camera in hand or posing for a group photo, etc... Shame to think how much historical information/photographs might have been irretrievably lost. In fact, I googled around and many geneaological sites don't even list this son, which is odd since he lived almost a year. I can understand missing children like Edward & Alexandra's son John who lived only a day, but a site devoted to geneaology should have something on him. I wonder what would've happened had he lived? The pressure mightn't have been so intense on N&A to produce a healthy heir if N had had him as his next brother. George was a smart fellow, but ill for such a long time before he died; Michael was charming but flighty. If Alexander could've somehow been a combination of the 2 (healthy and charming), married and produced children, N&A might've been content in knowing that the succession would pass to him and been freer to enjoy their family life. I don't think any photos were taken of her. There was an article somewhere not too long ago that shows a pre-teen Marie with Empress Marie A. and it says it was one of the first known photographs of the Romanovs. Since Alexandra died around 1847-9 (?) that was before the days of photographs. I haven't even seen a miniature of her before though, either. GrandDuchessElla I remember that article too. But you're right! There aren't any miniatures of her either! I was reading a book and there was a quote from MF that when AA died so suddenly, they had him sketched and photographed so they could remember him. It sounded like those were the only images of him. I've never seen the sketch but I imagine it's close to the photo. 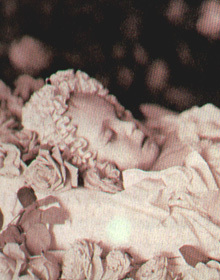 Ella - is the picture you are speaking of of the baby in the coffin in the frilly outfit. I too was told that was AA but Prince Nicholas Romanov told me he didn't think it was her - but was a noble baby. I can't remember what his reasoning was but will look around. Do you have any additional info on that picture? Sorry I can't post it. I can email it to you if you like. I had seen the picture in a Russian book. It was Alexander Alexandrovich (son of Minnie & Sasha) and not the other 'AA' (we really use too many initials--I'm especially bad) Alexandra Alexandrovich (daughter of Alexander II and Empress Marie). If you notice in my post you quoted it says 'him'. Sorry about the confusion. That's the only known photo of little Alexander. I also was curious to know why no other pictures of him exist, especially since you can find so many of Nicholas, George, Xenia, Michael and Olga as small babies. Men are haunted by the vastness of eternity. And so we ask ourselves: will our actions echo across the centuries? Will strangers hear our names long after we're gone and wonder who we were? How bravely we fought? How fiercely we loved? Imagine being the person your dog thinks you are.. There was a family photo of Alexander and Marie with baby Nicholas and so I think there must have been a photo of the four of them with baby Alexander, after all they were a royal family. It must be in the archives and as yet undiscovered. Because it does not make sense that the child lived for almost a year and there are no photos of him. You'd think, wouldn't you? There was a quote in a book (perhaps the Coryne Hall bio on MF) that they had him sketched and photographed so they would remember what he looked like. It seemed by that statement there weren't other pictures. That's the only known photo of little Alexander.